> Box > How much progress have we made towards the paper-free office? There are many opportunities for businesses to introduce the concept of paper-free or less intensive paper processes to their organizations. 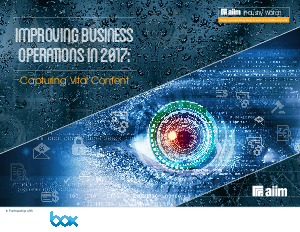 AIIM 2016 Industry Watch research found that “58% of respondents described their inbound handling of content as ad-hoc”. This is not surprising given paper is still fairly dominant in many businesses due to human desire to keep paper in hand for reading, note taking, and still today, signatures.